Gracie Gold reacts to her scores after competing in the ladies' free skate at the 2016 Prudential U.S. Figure Skating Championships on Jan. 23, 2016 at Xcel Energy Center in St. Paul, Minn.
ST. PAUL, Minn. - Gracie Gold learned after her less-than-perfect short program earlier this week that life isn’t always a fairytale. She noted at the time that “just because you go big and work hard, ” you won’t always skate perfectly and come out on top. For Gold, her free skate Saturday night proved to be the fairytale ending she needed. Gold came out on top in a stacked women’s field at the 2016 U.S. Figure Skating Championships at Xcel Energy Center in St. Paul, Minnesota, scoring 147.96 in her free skate for a total of 210.46. Her free skate was 1.02 points off from the highest women’s free skate score ever awarded at the U.S. championships. Her total was the third-highest total score in U.S. championships history. Not far behind Gold on the podium was silver medalist Polina Edmunds, who totaled 207.51 after a free skate score of 137.32. Reigning national champion Ashley Wagner was third with a total of 197.88, thanks to her free skate score of 135.47. “I am just over the moon, ” Gold said after winning her second national title. “I was so happy with how I skated tonight. Obviously, to win another U.S. title means so much to me, especially after last year; however, being second after the short program wasn't what I wanted. I knew that I had trained so hard for this competition and couldn't let anything go. I needed to be the best Firebird I could be. I am really so happy, so thankful and feel so blessed." 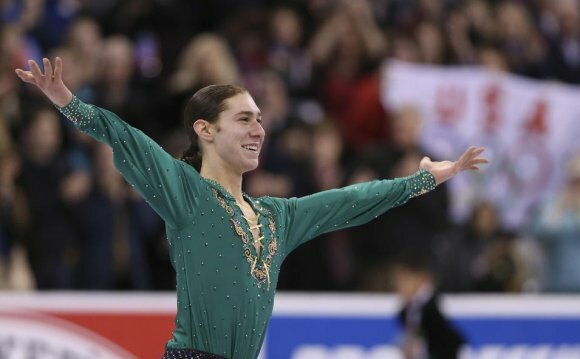 The 20-year-old won her first U.S. title in 2014 heading into the Sochi Olympic Winter Games, and was elated to reclaim it after finishing second to Wagner at last year’s championships. She attributed her win to the nothing-to-lose approach she took in her free skate. After downgrading a triple Lutz-triple toe loop to a single Lutz in her short program, Gold knew she had to put everything she had on the line in her free skate, set to selections from The Firebird by Igor Stravinsky. Seventeen-year-old Edmunds, on the other hand, was the only one of the three to skate two clean programs this week. She finished first in the short program – almost eight points ahead of Gold – but was overtaken by Gold in the free. The silver medal marked her second in her three years as a senior skater (she finished fourth in 2015). Wagner entered the competition as a three-time U.S. champion and, at 24, had her sights set on becoming the oldest U.S. women’s figure skating champion in 79 years. She was fourth after a faulty short program in which she fell on a triple flip-triple toe, but bolstered herself up to third after nearly clean free skate, where her only mistake was turning a triple Lutz into a single. The three women are expected to be the ones named to the U.S. team that will compete at the 2016 World Figure Skating Championships when it is announced Sunday. It is the same trio represented the U.S. at the past two world championships, as well as the 2014 Olympics. Gold, Edmunds and Wagner are all hoping to become the first (or one of the first) U.S. woman to medal at worlds in 10 years. And they are confident they can do it, especially with this year’s worlds being held on home ice in Boston, where they all qualified for the 2014 Games. Kimmie Meissner was the last U.S. woman to win a world medal when she won the event in 2006. “That statistic is really sad, but it’s not as if U.S. women have been irrelevant in the sport of figure skating, ” said Gold, who finished sixth, fifth and fourth at the last three world championships. “It’s just that illusive world championship. Last year was definitely my bad. I had a bad short program there. A medal was definitely mine for the taking – and I got a tiny one. We have an Olympic team medal, so we’re getting really close. Worlds are in the U.S. this year. We had some great skates in Boston. The stars look like they’re aligning. When a reporter said that Gold and Wagner’s short programs have become their undoing and asked how they plan to remedy that heading into Boston, Gold disagreed.